It's a very simple card and uses old CTMH stamps and papers along with a doilie and three different ribbons. To give it a little extra touch, I mounted the B&T paper on a piece of the same cardstock as the card (cut at 4 x 5.25) and sewed around the edges. The thing which struck me most forcibly was the idea that one of the sacrifices our heroes make is the opportunity to simply hug their children when something tragic and inexplicable happens. And tragic, inexplicable things happen more often than random shootings. Here at Fort Sill we are coming off a week of three deaths: suicide, car accident, and the spouse of deployed soldier killed when a man driving himself to the ER passed out and crossed a double yellow line. Can you send a hug in a card? I hope so, and I hope this sweet card lets some little girl know her daddy or mommy loves her very much. Now, I'm off to make a boy card because they need hugs, too. In two days my hubby and I will celebrate 28 years together. I decided to combine three challenges to make his anniversary card and let him know he is the star of my life. The stamps are CTMH Shining Star (retired) and a very old wood mounted sentiment set which has no title on the side. I embossed the star with clear powder then sponged Twilight from the center out and Sweet Leaf from the outer edges toward the center making sure to give my edges definition. The ribbon was tied using a Bow Easy (after looking up a video tutorial on how to use it), wrapped with white waxy flaxy and tied into a bow, then topped with a button. All of this was held in place with various layers of Glue Dots, Liquid Glass, and tape runners. The sentiment banner was hand cut, sponged with Twilight, and the curled around a pen to get the wave. I secured it with a thin strip of doubled sided foam mounting tape. And here's my favorite picture of the two of us. It was taken by a friend at Garden of the Gods in Colorado Springs before we were transferred to Oklahoma. 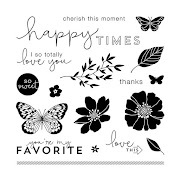 Stamps are all CTMH (Snowflakes, A Holiday, Frame it Up) in Juniper, Outdoor Denim, and White Daisy. All the snowflakes were cut with Art Philosophy cartridge. Glitter is Studio G from Hobby Lobby. Okay...gotta run. My husband is ready to see The Hobbit. NOW! I love tea. I can't stand coffee, but I make up for it with my love of tea. When I heard about a friend going through a rough patch with a disease flare up, I wanted to make her a feel better card. Not a get well card, mind you, because this is not something from which you recover. It's something that comes and goes with varying degrees of disruption. So, I decided to send her some tea because--as the English have known for years--tea makes everything better. The image is "Feeling Rosy" from House Mouse colored with Prismacolor pencils; B&T is old CTMH. I made my own pins by adding beads to sewing pins. The ribbon is one of my favorites (purchased from Hobby Lobby) and I'm almost out of it. Eeek! Time to do another HL run, although they are extremely dangerous. Can you see the shimmer on the cup (below)? I didn't want to cover the entire image with liquid glass to give it that porcelain look, but I did want it to have a little bit of shine. This loosely follows the Mojo Monday Sketch 270. Loosely. But that's the beauty of sketches. Whether you drink tea or not, little Miss Rosy is sure to bring a smile even when you aren't feeling so hot. I have been holed up in my craft area making Christmas cards like crazy. I have 40 done! Only 20 left before I'm done. I keep trying to cut my list down, but it always ends up right around 60 each year. Last year I went with different card styles for the first time. I decided I liked it and have been doing a little here and there for the past few months then got serious yesterday. 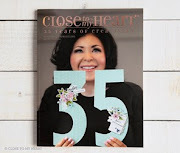 Everything is CTMH unless otherwise noted, so I am linking up to this week's Heart2Heart Christmas Challenge. Sorry for the blur, but this is the best one. Everything on ornament (except topper) cut with Art Philosophy. Paper is Roxy (B&T), Smoothie, and Black. Joy is painted with Pearl Paint mixed with water. Sentiment from December Word Puzzle stamped in Smoothie. Cut with Artist cartridge, backed with an old CTMH B&T (can't remember name--Jingle, maybe???). Glitter glue is Studio G from Hobby Lobby. I'm not sure why I can't get my remaining pictures to go any bigger--which is aggravating! (However, I think you can click on the picture and get a little bigger image. Try it. See if that helps. )Stocking and snowflake cut from Art Philosophy cartridge. White parts of stocking run through a Stampin' Up embossing folder. Red part of stocking and background behind stocking stamped with Universal Background in Cranberry and White Daisy, edges sponged in Gray Wool. More Roxy B&T. I cut lots of these ornaments. I made the topper by cutting Desert Sand paper with scallop edge Fiskars scissors, gluing a section to the top of the ornament, fussy cutting around the edges, and punching a hole. I also used Pearl Paint mixed with water to give it a shimmer. The Noel was cut with Artiste. I used a spray pen to spritz a bunch of colors, then dabbed with silver, bronze and gold pigment ink, covered it with clear embossing powder and heating. Again, I can't get the photo to enlarge for some reason to help you see it better. 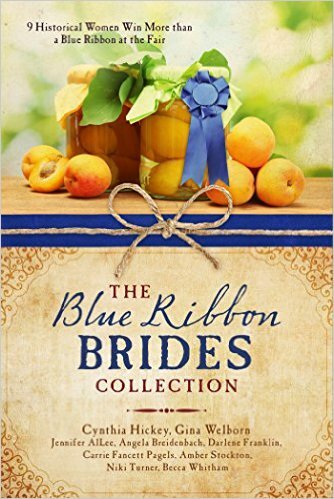 Burlap ribbon was cut in half lengthwise and tied with brown waxy flax through button holes. Same info on this stocking as before, only the plaid is Roxy paper. Background is Snowflake Cuttlebug embossing folder on Smoothie paper then sanded to expose the white core. Edges were sponged in Tulip. Torn piece is Desert Sand. Sentiment is from O Christmas Tree stamped in Tulip. Same info on ornament as above. Only thing different here is the Burlap ribbon over top of the Black and Smoothie. I have 14 more of these ornaments cut. I'm not sure if I want to keep playing with new ideas or just choose one of the ones I've already done and make a bunch of the same. Before I do anything, I'd better clean up. This place looks like a tornado hit it! The "thanks" was cut twice using Cricut CTMH Artiste cartridge. The back one was colored using the direct to paper technique with Slate ink. The ribbon is also CTMH in Slate. I wish the picture did the ombre coloring justice. I was showing my friend Copic markers. I did the "t" and then she did the rest. We used R24, R27, and R29. My friend had to leave before I got this finished, so she didn't get to see the finished product. I think I will take it to her when we meet for PWOC again next Tuesday. We had such a great time just brainstorming several ideas and working off each other's creativity. So fun to find a kindred spirit in a new place. On the writing front, I have also found a kindred spirit in a published author who lives only fifteen minutes away. I showed her my manuscript, she tore into it, and I am liking how the revisions are making my characters come alive. All this talk of kindred spirits makes me want to watch Anne of Green Gables. Maybe I'll get a group of gals together to watch it with me and find more kindred spirits among them. My daughter is in a contest. The winner gets to go shoe shopping. Since I am too far away to cheer her on up close and personal, I made her this card based off the Mojo Monday Sketch 267. All supplies are CTMH except for the lace ribbon (flower leaves) and my Copic BG75 which I used to create the teal background mat, ribbon, and flower center. Paper is Avonlea, satin ribbon is Slate, embossing powder is Mirror Platinum, and stamps are from Find Your Style (shoe, discontinued) and Wicked (sentiment, discontinued). I actually wrote in permanent ink on my Find Your Style carrier sheet that Wicked had a shoe sentiment. The flower center is a pearl brad with a gold rim. I was trying to just color the gold rim but I flubbed and got ink on the pearl part. Nothing to do but color it as well. Except the color wasn't going on smooth. Again, nothing to do but make it look like I intended it to be splotchy all along. As it turns out, I actually like the variegated/splotchy look. I created the flower by folding my Slate ribbon in half, sewing it with the a gathering stitch, and then pulling thread to bunch it up. I'm not sure what all is behind there to keep it together, but I think there's some tape, Liquid Glass (also CTMH), and a staple to hold the leaves onto the paper. It's a good thing no one actually sees the mess under the pretty! The inside sentiment says, "Live inspired; Dream with possibility." Here's to my girl! This card is entered in the Heart2Heart: Photo Inspiration challenge. It uses all CTMH products. My original idea didn't include the strip of Olive along the bottom, but the photo inspired me to add it. It's been crazy, busy around my house. I just returned from a women's conference in Nashville. We stayed at the Gaylord Opryland Hotel. My word!! It's a mile long walk from one side of that thing to the other. We arrived Thursday night after a 16-hour bus trip to see lots of people in their blingy finest. The next day I found out they were on their way to the CMA awards. Apparently The Grand Old Opry is a few steps outside the hotel. I was so busy trying to keep track of the 50+ ladies in our group, I didn't step outside the hotel all weekend. Nor did I take any pictures. Bad me (slapping my wrist). However, I did come home and check Colin Raye's tour schedule. He is coming to a small venue in Decatur, TX this weekend, so I'll get my country music fix in that way. A few days ago we had a special celebration at chapel with the theme "Rejoice." It seems both appropriate and ironic that I took the leaf from my name tag and used it to create this sympathy card. The sentiment is from Peddler's Pack (2001) stamped in CTMH Cocoa ink. I grabbed paper from my scrap drawer so I have no idea where the brown or green papers came from. The middle mat is CTMH Goldrush cut with Fiskars deckle edge scissors and sponged with CTMH Autumn Terracotta. The acorn and leaf charms are from Buttons Galore & More. I am entering it in the Less is More: Autumn challenge. The lady for whom I made this card has just buried her second husband. Praise God that we do not grieve as those who have no hope. It's been a long time since I posted. Lots going on around here, but nothing of monumental importance...or even blog-worthy. So, I'll just get straight to the card. I used the Fall Favorites stamp set, edge distressor, paper piercing tool, and ribbons from CTMH. I also used Copic markers, though they did not blend as well as usual because I didn't use great paper. I really love this scarecrow, and have had lots of fun coloring him. My friend, Terri Haynes wrote a book called Love Simplified. She self-published it and, I'll be honest, that made me nervous. But Terri sent me a copy of the manuscript and I finally got a chance to read it today. Yep, I read it in one sitting. She totally sucked me into her story from the first page. Her heroine, Tempest Day, is a relationship expert who has helped many people find love but has never fallen in love herself. When she exposed on national television as a fraud, she agrees to become the star of her own reality show to prove her seven-point compatibility system really works. Not being a reality show person, that part made me nervous, too. (Reviewing the work of someone you call friend is not an easy thing sometimes.) But Terri handled the show part with more class than pretty much every reality show I've ever stumbled across while channel surfing. The background insight made wonder how much she knows about TV production first hand. I felt like I was behind the scenes. 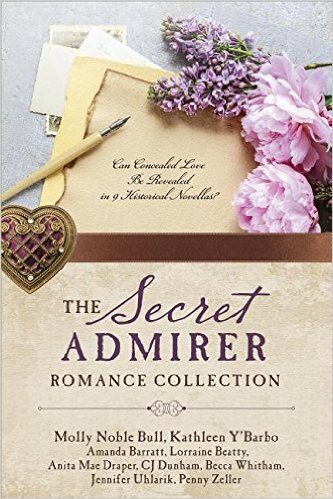 So, if you are looking for a great story and want to support an author directly, go to Amazon or Terri's blog and purchase a copy of her debut novel. "I could not even fulfill the one reason God created women." This heartbroken woman spoke of her inability to bear a child. Another woman lamented her single status because she had no husband to whom she could be a "helpmeet." After all, that's why God created women. While I have no wish to diminish the pain of one who can't bear a child or who has remained single despite a fervent desire to marry, truth compels me to expose their faulty thinking. God did not create women to be wives nor to bear children. God created women for the same purpose he created men. Genesis 1:27 says, And God created man in His own image, in the image of God He created them; male and female He created them. The preposition in translates into as thirty-five percent of the time. It puts a slightly different slant on this verse. Read it again, this time substituting as: And God created man as His own image, as the image of God He created them; male and female He created them. Man (as in mankind, both males and females) was created to be God's image bearer on earth. Notice it is what we were created TO BE. Let's look at Genesis 2:18. Then the Lord God said, "It is not good for the man (Adam, male species) to be alone; I will make a helper suitable for him." The problem with humans is we tend to look at everything in light of what we are TO DO rather than who we are TO BE. If you read this verse with TO DO glasses on, you see women as servants, there to help Adam complete his tasks. But if you switch out the TO DO glasses and put on the TO BE glasses, it reads something like this: Then the Lord God said, "It is not good for the man to bear the entire responsibility of being My image alone; I will make another who is suitable to help him meet this image bearing responsibility by bringing her uniqueness to the earth." Now that's an entirely different perspective on what it means for women to be the "helpmeet" of men. And it has nothing to do with being married, nothing to do with bearing children, nothing to do with anything TO DO. It's all about who we were created TO BE. How does that change the heartbroken cry of the barren or single woman? While that is always great news, this time it's more. You see, just over two years ago, her husband was killed in Afghanistan. He was the first chaplain to be killled in combat since the Vietnam War. She was left with three boys aged ten, seven, and one. Chaplain Goetz was in my husband's same Brigade. They deployed at the same time. And they had only been gone about a month of their year-long tour when it happened. My husband flew to the other side of Afghanistan to "cover down" until another chaplain could be deployed to fill the gaping hole left by Chaplain Goetz's death. I watched his widow cope with raw grace. She became my hero. And she is getting remarried today. Specifics: CTMH Avonlea WOTG, Slate Ribbon, Grey Wool ink and cardstock, Buttercup cardstock, rhinestone button, Versamark, White embossing powder. Non-CTMH: lace and silver ribbon, white embroidery floss, scallop edge scissors, Tombow adhesive tape runner. I created my background paper by rolling only the edges of the Avonlea stamps in Versamark and embossing them in the white powder. My color coordination would have been better with the new Slate paper from CTMH, but I didn't have it so I warmed up the cooler tone of the Grey Wool with Buttercup. Did I mention she is marrying a man with seven children of his own? For a woman who suffered eleven miscarriages, she feels it is God's way of restoring that which she lost. Blessings upon blessing, to you, my friend. You can never be too kind to nurses. My father-in-law is in the hospital. Because of his dementia, he doesn't understand what is happening to him sometimes. Today, he was hooked up to a heart monitor, a blood transfusion drip, a catheter, and a couple other tubey things. None of them made him happy, especially when the nurses wanted him to try to go "number two" on a port-a-potty while still hooked up to his catheter. He got very cantankerous, and before I could get back to his room from my short dinner break, he had hit all three of them and been verbally abusive. He was convinced they wanted him to take a shower with all of them. I think he was just horribly unhappy, couldn't understand why, and thought of the most terrible accusation he could at the moment. They gave him a sedative, and he was resting with his second blood transfusion drip starting when I left . All that to say, you can never be too kind to nurses. I made the them this card to say thank you for putting up with words and actions no one should ever have to, even if it is just part of their job, and even if they know he didn't mean it. In case you can't read the sentiment, it says, "Ginger Rogers did everything Fred Astaire did, but she did it backwards and in high heels." I love how that sums up the incredible feats some women are able to overcome with beauty and grace. It's been an exhausting day, so I'm going to briefly sum up the parts. CTMH: shoe stamp, rhinestone button, longer of the two pins, Watermelon mat paper, and white waxy flax. Versamark ink with black detail embossing powder. Sentiment printed on vellum paper. Ribbon from Hobby Lobby. Pearl accents, one colored with a black Copic. I entered it in the CASology: Shoe challenge. And for those of you wondering, I did not win the writing contest but I came away a winner anyway. I have permission to submit my completed manuscript to the woman I dearly want to become my agent. Plus, several multi-published, award-winning authors were kind enough to take time with me and discuss the issues I am having trying to get my first book done right. Here a couple pictures of the Gala Awards dinner. With my roommates. L to R: Kristen Joy Wilks, H.A. Caminiti, and me. It was a good conference for the ladies of room 323. With the other award finalists. L to R: Karen Barnett, me, and our winner, Brandy Cole-Vallance. And finally, with my wonderful hubby who drove three hours each way, got lost in horrific construction detours, and still loves me. Funny story. During dinner, I barely missed nailing my satin blouse with a buttered roll that slipped out of my hand. I still think, if I had a grease stain down the front of me, I would have won and had to get up in front of 700 people to show it off. It's sketch time over at Heart2Heart. This was a real stretch for me, but I like how it turned out. Almost everything is CTMH and came in my latest box. Yee Haw! Stamps are from Fall Favorites and Rugged Dude, paper is Pemberly. The only non-CTMH accessory is the jute bow. I stamped the rivet from Rugged Dude, covered it with liquid glass, and then inked the rivet with VersaMark and stamped it on the wet liquid glass. I don't recommend this...but I was in an adventurous mood and had cleaner handy!! The jean pocket was stamped in Twilight and overstamped with Chocolate. The "100%" tag was stamped in Twilight first, but it didn't show up well enough so I overstamped it with second generation Outdoor Denim. "Fall" was stamped in Desert Sand (second generation then rolled along the edges). I am in love with this Burlap ribbon. I think I'm going to need to order more soon. And this scarecrow just makes me smile. Here's wishing you a fabulous start to my favorite season of the year! 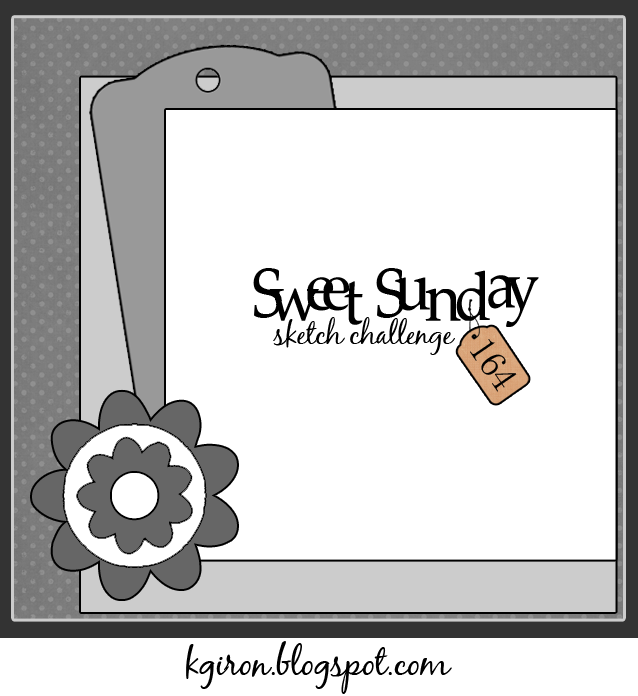 Okay...so it's Saturday and I'm just now getting around to playing with Sweet Sunday Sketch Challenge167. But, I did at least make it before the next Sunday challenge is up! That has to count for something, right??? I'm not sure if you can tell from the close up (which blogger wouldn't let me make bigger than this for some, dumb reason), but there is glitter on the snowman and FunFlock on the hat and cuff. For the snowman, I used Glitter Glue by Studio G and smeared it around with my finger and a paint brush. The FunFlock was added with a base of Liquid Glass then I lightly sprinkled the white flocking on top and tapped off the excess immediately. I wanted the stamped image underneath to show through. Stamp is from the "Snow Angels" set by Stampin' Up! Paper is by CTMH (Pemberley, Outdoor Denim, and Desert Sand). The scallop edge is by Fiskars, and the pearls are from somewhere. I used a combination of Copics and CTMH matching markers. Ink is CTMH Outdoor Denim. I have become a stitching snob. I tried this without and didn't like it, but I couldn't fit it under my machine after I had already glued everything down, so I simply used a marking pen and a gold gel pen. I don't like it as well as if I'd done actual stitching, but it's better than it was plain. Writer's conference is in less than a week and I am SO NOT READY! Eeek! No words necessary...other than to say this is for the challenge over at May Arts. The tutorial made mention of using this over B&T paper you weren't too excited about anymore. This paper immediately came to mind...and is why I jumped (yes, jumped) up to try it. Run you paper through the whatever embossing folder system you use. I have a Cuttlebug. Leave the paper in the folder while you gently rub Versamark ink over the raised part and emboss with clear powder. Next, you use a sponge dauber or the direct to paper technique to ink the background. I used CTMH Twilight, Juniper, and Outdoor Denim in different areas. The tutorial used black which really obscured the background paper. This paper is the thin weight, and if I were to do this again, I would mount it on some cardstock weight before running it through my Cuttlebug because I had real trouble not getting my Versamark ink in the cracks and crevices as you can see at the top in particular. However, with the sloppy embossing powder problem, I thought the background had a grungy, masculine feel and decided to use it anyway. Because I am getting ready to put a package in the mail for Operation Write Home, I decided to add a touch of ribbon to give it a tiny bit of girl power so the card could be for either a boy or a girl. (The ribbon is actually cream and brown but it was too startling against the background so I used some of the leftover ink in my sponge dauber and gave it a little Twilight coloring.) OWH is having a Mid-Week Throwdown Challenge: Masculine. Even with the ribbon, I think this still qualifies. Now it's your turn to jump (yes, jump) up and try it yourself. Last Sunday, my mother-in-law passed away. We were just processing that news when I got an e-mail from Karen Giron over at the sweetest thing. She chose my card as the SSSC164 Winner and guest designer for SSSC166. I told her it could not have come at a better time because there is going to be no memorial service for my MIL and it was harder to let her go without doing something to honor her life. The stamps and paper are from CTMH. The sentiment is hand written. I actually have a stamp that says "Fleas Navidog" which Momlyn bought for me (because she also loved a good word pun), but it's too large to fit inside the little sign over the doghouse door. The dog has five layers of foam mounting tape. 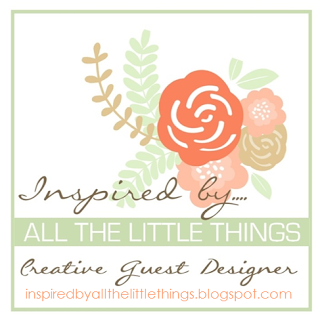 Yeah...it's a little overkill, but this is my first ever guest designer gig, and I wanted it to be extra special. I used the following Copics for my coloring: E50, E53, E55, E57 (dog/doghouse); R00, R22 (nose/cheeks); and R29 (to color pearl accents). The icicles are Studio G glitter glue. I made the pennants using regular kraft paper which I ran through my paper crimper. Remember paper crimpers? For some reason, I have pulled it out more in the last couple weeks than I have in the last couple years. Momlyn did not call herself my mother-in-law. She said she was my mother-in-love. In many ways, she was a very different kind of woman. We are pretty sure she had Aspberger's (a form of Autism) and could not interpret non-verbal clues. It made communication challenging, and there are some really funny stories about miscues. But what she did do was raise four children who are all wonderful human beings. I'm partial the the baby of the family. If you are so inclined, I'd appreciate you becoming a follower of my blog. I'm hoping to sell my novel at conference this year, and the more followers I have the better the publishing houses like it. Nothing like shameless promotion, huh! Thanks to Karen for giving me the opportunity to share my tribute card. I always promise myself I am going to start my Christmas cards earlier. Well...at least I'm starting in August instead of October. The stamps are all from CTMH but different, retired sets. The hedgehog is really old but I have never been able to let go of him. He's just too stinkin' cute! I colored the mittens with pencils to give them some shading. I also cut and mounted the top mitten, cut the hedgehogs hands and glued them to the top so it looks like he is peeking up. The ribbon was bought at Hobby Lobby last year. I really like it so I've been hoarding it. Why do I do that??? We received some sad news on Sunday. My mother-in-law, who had been suffering with Alzheimer's, passed away. While we are relieved that she has been released from the body into the arms of Jesus, we will miss her greatly. She was my best editor, and I wish she could have read my current novel as I'm sure she would have loved it. My husband is now in the process of moving his father to a memory card facility close to us. He suffers from Sr. Dementia so we aren't sure if he quite comprehends all that has happened. Christmas was my mother-in-law's favorite holiday. I hope you will come back Sunday as I will have a special tribute card for her. 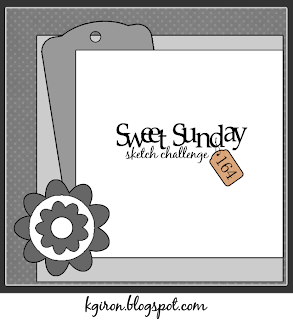 I was chosen as the guest designer for the Sweet Sunday Sketch Challenge through Karen Giron' blog, the sweetest thing. She sent me a top-secret sketch and a badge for my blog. Since there will be no memorial service for my mother-in-law, and it is hard to let her go without doing something to honor her life, I will have another Christmas card but that's all I can reveal. I have a confession to make: I am addicted to Pinterest. So are you. Don't bother to deny it. And if you have paid any attention, you've noticed the chalkboard trend. Everything is being turned into a chalkboard from serving trays to on-the wall-calendars. With the "School" challenge over at CASology, I had the perfect excuse to use my 40% off coupon at Hobby Lobby and purchase some chalkboard spray paint. I used chipboard banners which came in the CTMH Art Philosophy Cricut cartridge bundle I purchased last year, sprayed them with two coats of paint, let them dry overnight (probably the hardest part of this whole card), and stamped using two different alphabet sets from CTMH: A Typeface and Believe Caps. The plus and equal signs were made using the "I" from A Typeface. Can you see the chalkboard dust? It's actually cornstarch out of my embossing buddy. I used CTMH White Daisy ink and it wasn't drying. Yes...I should have used my StazOn ink, but I don't have the cleaning solution. You know how that goes. Besides, the chalkboard dust is sortof cool. The whole can cost $7.99 (without the coupon), and I have plenty left for future projects. Now, I am aware I could have achieved the same effect by just cutting black banners or inking the banners in black ink, but this is a SCHOOL challenge. I know it's chalkboard paint, and you know it's chalkboard paint, and that's what matters! I don't have a huge need for school-themed cards. My "babies" just turned 24 and 26. But I am putting together a stash of cards for Operation Write Home, so I thought I'd make this card a little more general for them. Time to get to work. 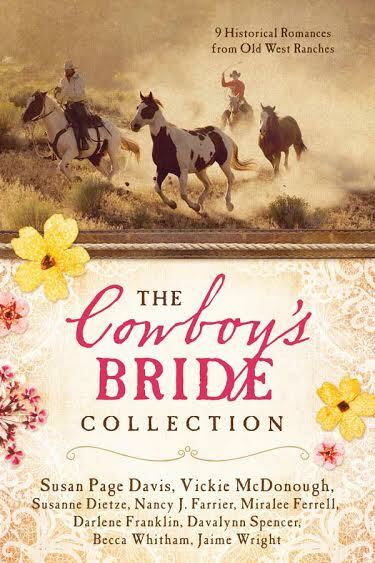 I need to create a One-Sheet for the ACFW Conference next month. Basically, it's the blurb on the back of a book cover to create enough interest for someone to lay down their hard-earned cash. Those of you coming from the Heart2Heart blog who have not been around for about fifteen years will not recognize these stamp images. The labels say D.O.T.S. with a 1989 copyright date. Can I get someone--anyone--to tell me they still have some of their oldies but goodies? I have drawers full. To get the pond, I swooshed my watercolor pen through Moonstruck, Twilight, Juniper, and Pear using the "press the lid into the ink pad" method. (I'm very technical around here.) Once I got an even swirly look, I picked up more Moonstruck and flicked it, then more Pear and flicked it. I had to let the paper dry before stamping the black grasses and sentiment. Anyone want to guess how I learned that lesson?? I'll tell you another lesson I learned. You can't mask off edges well enough for watercoloring. I tried scoring my lines and masking, coloring, stamping with two long sticky notes. Yeah...not so much. This second attempt was done by cutting two smaller pieces of paper, watercoloring/stamping one, mounting it on a wider one, and scoring the edges with the Martha Stewart Score Board using the edge of the watercolor piece as a guide. I scored a second line then trimmed very, very close to it. In other news, I finished my novel!!! It has holes the size of trucks, but it's done. I am taking today off of mine and critiquing the work of my writing partners instead. I also need to write a summary sheet to take to the American Christian Fiction Writers conference in September. Hi ho, hi ho...it's off to work I go. I do not spend hours scouring the internet for writing advice like I do to get inspiration for cards and scrapbook pages. I have a few "go to" sources which hook me up. The first is Steve Laube's blog; the second is Rachelle Gardner's. It's just better for me to stick with a couple good ones rather than trying to find little bits of wisdom scattered here, there, and everywhere. The Steve Laube Agency recently posted a link to the Keynote Address from the Romance Writers of America Conference. If you are a writer, you need to read this. The first challenge is a sketch being sponsored by Karen Giron at the sweetest thing. I go to Karen's blog on a regular basis, so it's fun to play along for the first time with one of her challenges. My card is only 4.25x4.25, so I had to scale everything way back as you will see in a moment. 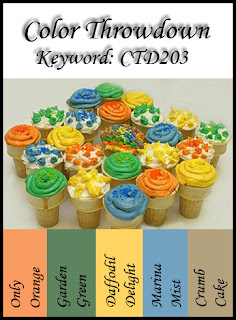 Color Throwdown is another challenge I follow regularly though--again--this is my first time to join the fun. I used a discontinued paper pack by CTMH called Caboodle. It's one of those packs I don't pull out very often, but it had all the colors of this challenge. I just needed to add some kraft (substitute for Crumb Cake). 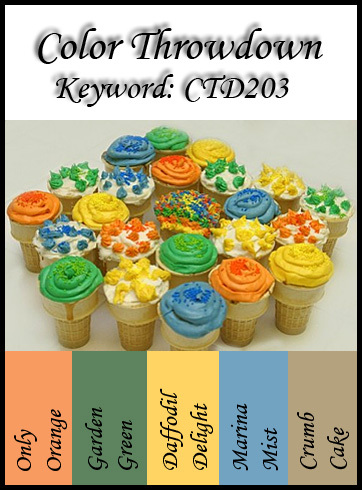 The other CTMH colors to substitute for this are Sorbet, Heavenly Blue, Sweet Leaf, and Buttercup. The tag is also CTMH from their line of Dimensional Elements. The last challenge I combined into this card is Operation Write Home: Masculine. I need a card for my soon-to-be 26 year old son. Yikes...can I be that old?? The scalloped ends of the banners were created using a flower punch. I saw it done with a square bunch so I put a little twist on it. I originally had a blue button where the ribbon is but it was just a shade too bright. The "U" was done by stamping on the back side of some corrugated kraft paper and then fussy cutting. I tried to emulate Karen's style with lots of layers and stitching. Pretty pleased with myself getting three challenges combined in a card I needed to make anyway. And now...back to the Olympics. Go team USA! I used a Martha Stewart punch and score board to create the lattice-work border and embossed lines. The hardest thing about this was cutting that little bird out and x-acto knifing the leaves for it to slide behind...because I forgot to do it before mounting the birdhouses to the card. Duh! I also used a boatload of Copic markers. What makes the difference between CAS but boring and CAS beautiful is the detail added to the coloring. I am still learning how to color. Art was never my strong suit in school, so I'm feeling pretty stinkin' good about the progress. Time to get back to writing. My poor heroine is in dire straights and the hero is rather beat-up but limping to her rescue.